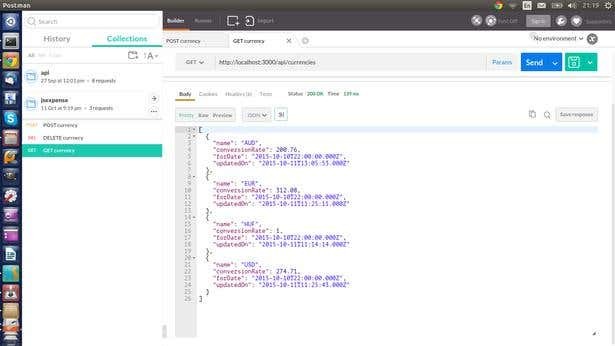 This article demonstrates how MySQL can be accessed and how data can be manipulated from node.js. The source code presented in the article can be accessed on GitHub in my jsExpense repository. The project is an expense tracking software that supports different currencies, allowing users to store and track family expenses. You should have access to a MySQL server where you can create a database and tables. The easiest way is to install MySQL locally, and you can find the installation steps here. You can read more about Express.js and the philosophy behind the framework from one of my previous articles, Express.js in Action. Besides these, each of the models has an updatedOn field which stores a timestamp of the last modification date of the entry. The sql folder has the SQL code for creating the MySQL tables for these data models. The connectionManager.js contains the connection details for the MySQL server and has a method for creating connections. 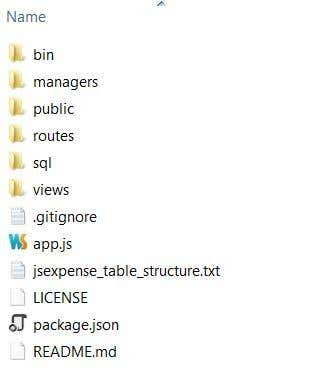 First I import he mysql package, which was installed by the npm install command that was done when setting up the project. For the moment, please ignore the q package—that is included to use promises as an implementation approach. I will cover promises in another article. The getConnection method creates a new MySQL connection using the createConnection function from the mysql package. The parameter of the function should be a JSON object with host, port, user, password and database properties. If you're working with UNIX, there is an option to specify the socketPath for the createConnection method, but if it's already specified, the host and the port properties are ignored by the driver. Once the connection has been created, we should try to connect. The connect method uses an argument with a function that will get an error if the connection wasn't successful. If an error is received, then the promise should be rejected, basically throwing an error up the stack to notify the invoker that there was an error with the connection. If are no errors, we can return the connection object. The connection has a unique identifier that's stored in the threadId property of the connection. I log this property when the connection was successfully created. The prepareQuery is a helper function, which is used for parameterized queries sent towards MySQL (more on this later). At the end of the file, I update the exports and return the two methods. The currencyManager.js contains all the data manipulation methods related to the currency data model. The code starts with importing the connectionManager. The getCurrencies method loads all the data from the currency table. Here I use the same promise structure than before. I create a new promise, then ask for a new connection from the connectionManager using the getConnection method. Once the connection is ready, I invoke the connection.query() function. 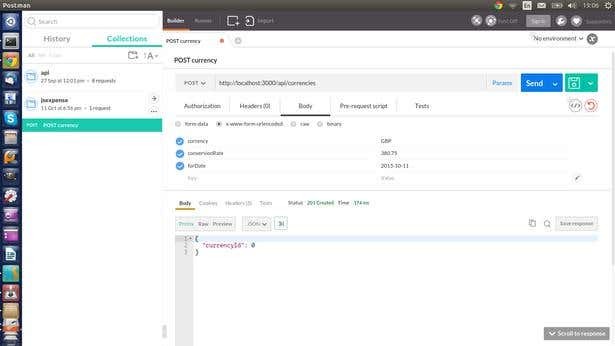 The first parameter is the SQL query which will be executed by the MySQL query engine, SELECT * FROM currency, will load all the currencies stored in the database. The second parameter for the query method is a callback function, which is invoked when the database engine has executed the query. The callback function has two parameters, error and results. If there is an error, log that to the console and reject the request to pass the error up the stack. Otherwise, return the results. The next method in the currencyManager.js is addCurrency. This method should receive name, conversionRate and forDate parameters. These are the fields of the currency. Then define the SQL for inserting a new currency in the database. Please note the ? symbol in the currencyInsert string. The question marks will be replaced by the connectionManager’s prepareQuery method with the values of the name, conversionRate and forDate parameters. In this case, I used the same query method of the connection to insert a currency used for loading the currencies. While the error handling and happy flow handling is the same, there's a difference. Inserting the mysql node driver can return the ID of the newly inserted item (results.insertId). The addCurrency method is invoked by the express framework when there is a POST request with form data sent to the /api/currencies url. On the screenshot above, the currencyId is 0. That is the default value of what the framework returns, which is not correct in our case. Because the id in the case of the currency is the name field, there is no id field available in the database. When the creation is successful, send an HTTP 201 CREATED response code to the client to confirm that the creation of the entity was successful. The deletion of a currency is implemented in the deleteCurrency method. The structure of the delete query and operation is the same as in the case of insert. In this case, I only changed the query string (DELETE FROM currency WHERE name = ?) and replaced the question mark with the name parameter given to the deleteCurrency function. In case of a delete operation, the result object has an affectedRows property that contains the number of the deleted rows. 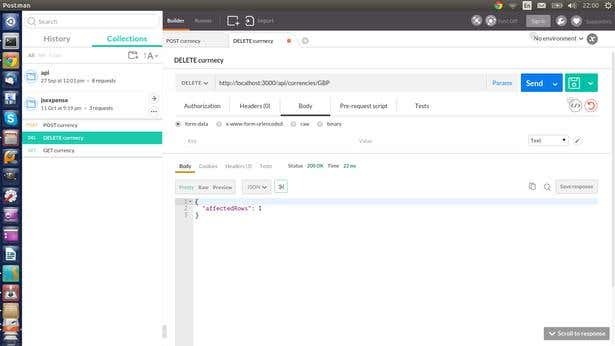 The deleteCurrency method is invoked when an HTTP DELETE request is sent to the /api/currencies/:name URL. Besides insert, update, and delete, the mysql driver for node.js supports executing multiple queries, stored procedures, executing joins, and of course, running transactions. The MySQL Node.js driver offers a clean interface for manipulating data stored in MySQL data.